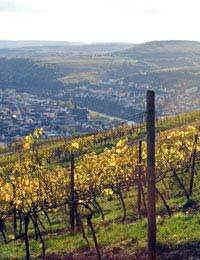 The Rheinhessen is the largest wine growing region in Germany best known for its production of Muller Thurgau, a grape developed by German Dr Muller as a cross between the Riesling and the Madeleine Royale grape. This region spans 26’000 hectares of land and has produced wine since at least the times of the Roman Empire. Sheer quantity of growth, coupled with the benefit of time clearly equals formidable wines, despite the lowly reputation of German wine. Muller Thurgau grapes are smooth and sweet, yet slightly dry, and make a good all round wine suitable for glugging with as meal, or simply ‘quaffing’. Silvaner and Riesling are also produced in the Rheinhessen where a mixture of steep hills, rolling valleys and flat orchard areas make for widely varying finished products. Of these products, the Muller Thurgau and Riesling are the most sought after, with the Sparkling wine also being of an exceptional quality: Try for example, the famous sparkling ‘Deinhard’ wines. The Rhienhessen is bordered by two rivers, The Rhine (in the North), the Nahe (to the West), and by the Haardt Mountains. Wine from this region has suffered somewhat due to its association with ‘Liebfraumilch’, a poor cheap wine exported to the UK for the budget market (see related article: German Wine Regions). For many reasons that British, French and other wine markets have seen fit to sustain a rather dim view of German wines (and especially those from the Rheinhessen) despite the fact that many German wines are really very good. Attitudes however are changing towards German Wine, and the Muller Thurgau grape is enjoying success across Europe, especially in Italy, Hungary, Austria and Slovakia. It is variously known as Muller Thurgau, Rizvanac (Croatia), Rielsing X Silvaner (Switzerland) and Rivaner (Luxembourg). Naturally, it thrives best in its homeland, where if one knows where to look very good value quality wine can be found. There are a few red varieties produced in the Rhienhessen. These account for about 20% of all wine produced there, and whilst some are perfectly drinkable, they really do not merit much of a mention. The Rheinhessen, like Germany is not the place to go for a good red. Best stick to the whites, and turn to New Zealand, Spain or France for Red! The Liebfraumilch, or Liebfrauenmilch (in its correct German spelling) is actually a perfectly good German Table Wine. The ‘Blue Nun’ branded variety that is well known in the UK happens to be a particularly bad example known for its popularity amongst teen drunks and poor students. For an example of Liebfraumilch at its best try 2004-2005 Langenbach Liebfraumilch Rheinhessen. Alternatively, try any Riesling from the region: A good supermarket wine should suffice – high quality Riesling’s come in at much lower prices than quality French, Spanish or Italian wines. For a typical good quality Muller Thurgau try the 2006 medium dry white ‘Niersteiner Gutes Domtal’. It is characteristically rich and sharp with an off dry to sweet complexion and fruity notes. Riesling and Muller Thurgau go well with rustic breads and other starchy foods, seafood and Turkey Roasts. Their dry and sharp flavours are an ideal compliment to Roquefort cheese.